Last year, Vitamix introduced the S30 blender. For those who don’t know, the S30 is a personal sized blender that provides the power and performance you would expect from Vitamix. The great thing about the Vitamix S30 is the size. It is a compact blender designed for the person on the go. This year Vitamix introduced a few more S-Series Blenders that give you even more of a reason to buy Vitamix than a Ninja Professional Blender or Nutri Bullet Pro 900 Series blender. Below is some information about all of the Vitamix S-Series blender models. If you have any questions about any of these models, send us a email! The S30 provides the power and versatility of a high-performance blender, but with the convenience of a personal blender. The S30 allows you to make single and double servings of your favorite recipes. Vitamix Deal: If you want the S30 and are looking for a deal, we highly recommend buying the S30 reconditioned machine. These blenders are in like new condition and provide the same power and performance of a brand new one. 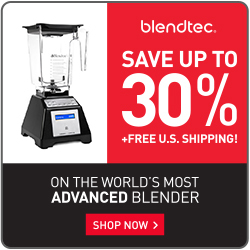 Remember to use promo code ’06-009709′ to get free shipping on all Vitamix blender orders! The S55 offers the same benefits and power of the Vitamix S30, but with four pre-programmed settings in a personal blending size, and a simplified way to make popular Vitamix recipes. The Vitamix S-Series Blenders motor has 790 watts of power (1-peak horsepower). This is 3x times the power of the Magic Bullet. The compact size and over heating protection with automatic shut-off protection provides a safety mechanism to those who worry about damaging the motor. The Vitamix S-Series Blenders come with 2 containers. The standard container is a 40oz while the smaller / on the go container is 20oz. Both containers are constructed out of BPA-free Eastman Tritan® copolyester. The great thing with the portable container is the screw-on / flip-top lid. This makes it great for taking your smoothie or beverage wherever you go. All S-Series containers are dishwasher safe as noted above. This is great for me as I prefer to put in the dishwasher than to clean right after I use the container. Cleaning containers is very easy as shown in the video we created that shows how to clean a standard vitamix. The Vitamix S-Series Blenders comes with a 5-year full warranty, which is slightly shorter than most of the other Vitamix machines. The thing that is a littler different about the Vitamix S-Series Blenders is that all the other Vitamix blenders have a 7-year warranty. You can upgrade to an 8-year warranty for an extra $75.00. We suggest you go with the 5-year warrant and contact them if you run in to any issues. The Vitamix support folks have always been great to work with if something does happen to your machine. The Vitamix S-Series Blenders are an absolute amazing series of blenders for those looking for a compact, powerful, and versatile blender. The new S50 has 2 pre programmed settings while the S55 has 4 pre programmed settings. Other than this, the machines are very similar. The 2 containers provide you the ability to make and transport almost anything. If you are looking for a lower priced blender, we recommend checking out the Vitamix reconditioned machines, Ninja Professional Blender, or the Nutri Bullet Pro 900 Series. If you have recently visited the Vitamix website, you probably noticed they updated their blender comparison page. This page provides a high level comparison of each blender series, but doesn’t provide all the information you need to make an informed decision to make a purchase. Vitamix Certified Reconditioned Series offers first-class blending performance. Each machine is inspected and reviewed to make sure they meet the high Vitamix quality standards. These machines have a great warranty and an unbeatable price. As you can tell from the information in this post, Vitamix has introduced a number of different S-Series personal blenders. These machines are smaller, lighter, and comes with 2 containers to make this the most versatile machine produced by Vitamix. The Vitamix Classic C-Series blender series offers a variety of control options and container sizes, all with the classic Vitamix body style. Choose from High/Low controls, Variable Speed Control, and convenient pre-programmed settings. The C-Series includes blenders from a few product lines including CIA, Creations, Professional Series, TurboBlend, and the 5200/6000 product lines. The Vitamix Next Generation G-Series blenders represent the next generation of premium blending, offering powerful motors, a sleek design, and the latest sound dampening technology. These low-profile machines easily fit beneath standard cabinets that allow them to remain accessible on the counter for everyday use. The C-Series includes blenders from a few product lines including Professional Series, Creations, and the 7500 product line. Have you or anyone you know used the new Vitamix S30 personal blender? We look forward to hearing feedback and any experiences with this new Vitamix blender!